How Healthy Is This Sweet Treat? Vegan cupcake. Is that an oxymoron? Vegan implies healthy and animal-free but cupcake implies dessert, butter, and sugar. Can the two exist together? And how healthy is it, really? Lately I’ve had a few experiences which made me ponder this question, mostly when I congratulated myself for ordering “healthier” sweet treats and then later wondering if I’d really fared any better. The first one happened after I posted a link to a Food Network segment on Unwrapped about Sweet & Sara vegan marshmallows on my Veg Girl RD Facebook page. Along with Belgian chocolate and a graham cookie, they use the marshmallows to make vegan smores. After watching the segment, a reader commented incredulously, “margarine and corn syrup???? ?” It got me thinking. She was right. Margarine and corn syrup aren’t foods I’d normally endorse or encourage, but at the same time I was excited to give a shout out to a company that was trying to make a marshmallow without gelatin. The video was taped in 2008 and Sweet and Sara has since gone non-GMO and changed their recipe slightly. Here’s the current ingredient list from their website for the vanilla marshmallows: tapioca syrup, vegan cane sugar, water, non-GMO corn starch, carrageenan, non-GMO soy protein, acacia, pure vanilla extract, sea salt, locust bean gum, organic confectioner’s sugar. Compare that to Kraft’s Jet-Puffed miniature marshmallows: corn syrup, sugar, modified cornstarch, dextrose, water, contains less than 2% of gelatin, tetrasodium pyrophosphate (whipping aid), natural and artificial flavor, blue 1. Neither food looks much like a healthy diet staple that we should strive to eat more of; I think we can all agree that marshmallows are essentially chewy sugar puffs. But I would argue that Sweet and Sara is trying to take a mass-produced junk food from junky to less junky. Another case in point: I was attending the International Food Bloggers Conference in September, I stopped at a local coffee shop, perused the menu, and ordered a somewhat questionable morning beverage. As you know from past posts, I am a reluctant fan of Nutella since it isn’t a healthy product. (See Nutella posts #1, #2 and #3 for my long and sordid history with this creamy temptress.) 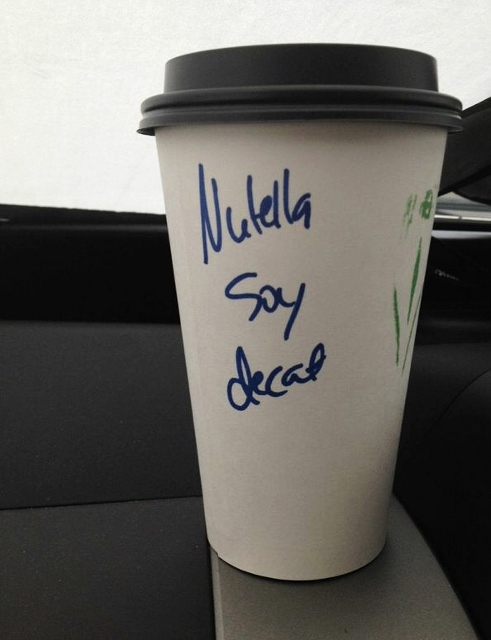 There it was on the menu: Nutella Mocha. I was away from home, at a conference in the big city, which sort of felt like I was on vacation. I don’t know about you, but this generally means I feel like I can treat myself. I didn’t notice the irony until I got settled in my seat at the conference. 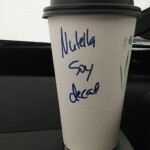 The barista had scrawled my order across the cup for my fellow bloggers to see: Nutella soy decaf. There was no hiding it. It almost seems like a joke order, like a skinny latte with extra whip. But what if we really compared the two? The research so far on coffee is either neutral or positive. But, I happen to be pretty sensitive to caffeine, so I have to go decaf if I want to be able to control my lips and limbs for the next few hours. I don’t think it’s a big deal for most people, as long as they keep it under about 3 cups a day. And I happen to think soymilk and skim milk (that’s part of what makes the latte “skinny”) are pretty similar nutritionally in terms of calories, cholesterol, and protein. If we don’t consider the effects of organic, lactose intolerance, GMO, BGH, animal welfare, etc., that’s pretty much a wash, unless of course you’re a vegan. Nutella is primarily sugar and fat, and so is sweetened whipped cream, so that’s probably fairly equivalent as well. 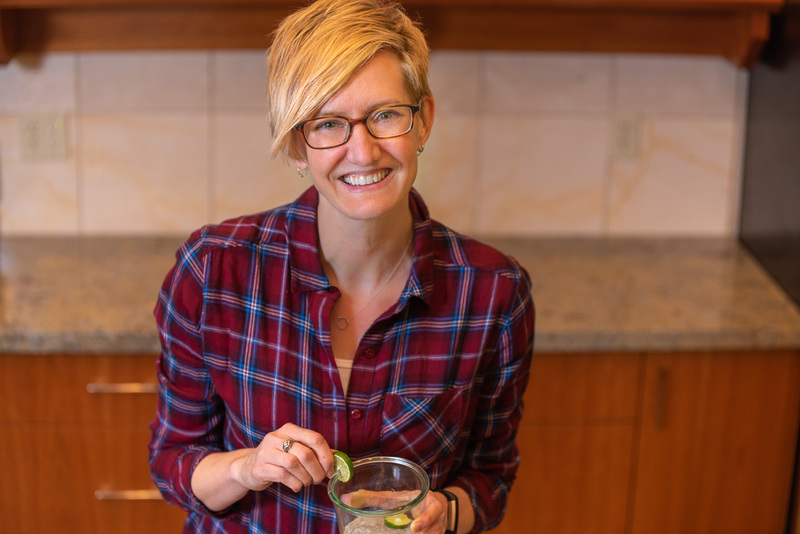 I’m not a fan of sugar substitutes (which is the other reason it’s “skinny”) so while it may have fewer calories, it’s a rather undesirable trade-off. (Starbucks uses sugar-free syrups with Splenda or sucralose, which is on CSPI’s “caution” list for food additives. More about their list later in the post.) So, I’m reducing my intake of some harmful nutrients but getting others in the process. Did I come out ahead? My next paradoxical example has to do with donuts. For breakfast one morning on the way to the conference hotel I wrapped my lips around a raspberry lemonade beauty from Mighty-O Donuts in Seattle. 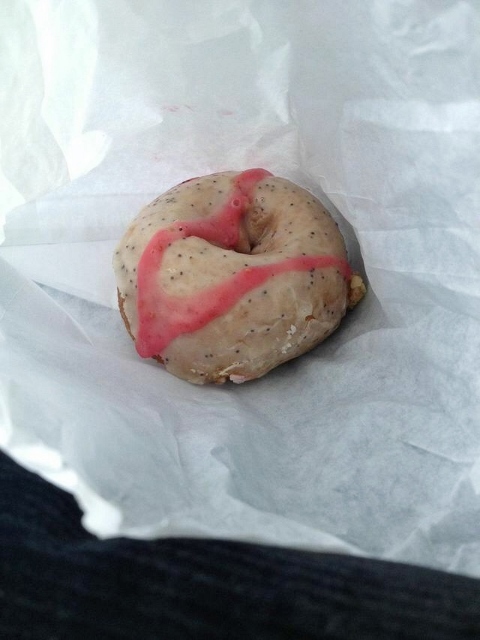 Donuts are not my typical breakfast of choice, but again…on a trip. Splurge-happy. The irony here? Mighty-O donuts are vegan, certified organic, with no hydrogenated oils, animal-derived ingredients, artificial coloring, or artificial flavors. Can you say the same about a Krispy Kreme? And then it was October, which somehow led to me buying a bag of candy corn from my local food co-op, made by Sweet Candy Company. On the front of the bag they proudly announce “non-GMO ingredients, no artificial flavors, gluten free”. But let’s look further. The ingredients are as follows: cane sugar (non-GMO), tapioca syrup (non-GMO), corn syrup (non-GMO), invert sugar (non-GMO), egg whites (cage-free), coconut oil (expeller pressed, extra virgin), colored with fruit and vegetable extracts (pumpkin, carrot and apple), titanium dioxide (for color), honey, natural flavors, salt, carnauba wax, confectioner’s glaze. Compare that to Brach’s Classic Candy Corn: sugar, corn syrup, confectioner’s glaze, salt, dextrose, gelatin, sesame oil, artificial flavor, honey, yellow 6, yellow 5, red 3. What about the Nutrition Facts? About 20 pieces of either product get you 145 calories, pretty much exclusively from sugar since the fat and protein contents are negligible. One is vegetarian, neither is vegan, and both are junk food. But next year I might be tempted to go with the company that’s trying to make a better candy. So what does this all mean? I think it might mean that it depends on who’s making the “healthier” sweet treat choice and why. Nutrition isn’t the only reason we eat what we eat. (In fact, for most Americans, it rarely even makes the top 10.) 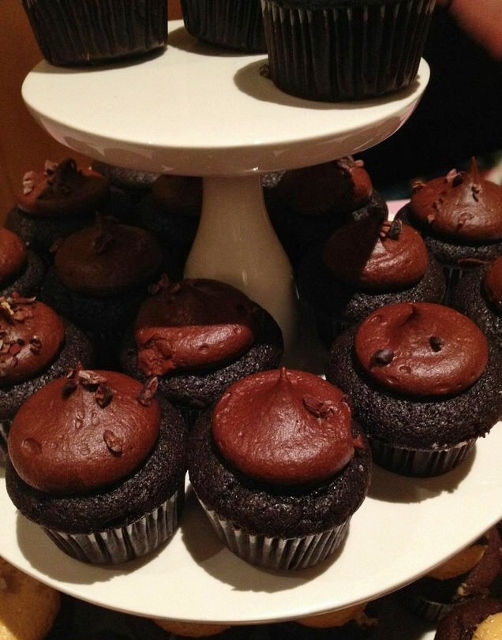 You may have a motivation other than health to eat a vegan cupcake. And while I admit that some of the benefits beyond nutrition are hard to quantify, it does seem like a smarter choice. I think it also means there are lots of choices along the spectrum, for nearly every diet and every food. In fact, even for oats there’s a continuum of less healthy and more healthy. Instant oatmeal is not the same as whole oat groats, even though both are technically oats. But there’s an enormous difference between the two in terms of texture and cooking time, so making the leap to a hearty bowl of 60-minute groats may seem impossible for someone who’s currently enjoying their 90-second Maple and Brown Sugar instant goodness, but switching to quick oats as an interim step may be reasonable. So, maybe it’s the same with sweet treats and junk food. Transitioning from a Snickers to an apple for an afternoon snack may not be an acceptable first step for someone trying to improve their diet, but opting for a Jokerz candy bar (peanuts, caramel and nougat in a rice-milk chocolatey coating) that happens to be vegan, cholesterol-free, and trans-fat free might be doable. There’s no doubt that both are candy bars, but choosing one is a baby step in the right direction over the other. And I think baby steps are worthwhile and should be encouraged. Changing your diet is hard. It takes awareness and motivation and education, and it can take a long while to get to the so-called final destination. A journey of a thousand miles begins with a single step (Lao-Tzu) and they say we make 200 food decisions a day, so maybe if a handful of them will move us towards a better diet a few years from now, we should appreciate the small victories. What are you thoughts on seemingly healthier junk food? Do you think making the “better” choice makes a difference? Disclaimer: I have no one to blame but myself: I paid for these sweet treats. None of them were freebies. However, I did get a discounted registration fee for agreeing to blog about the conference. Hi Alice. Thanks for reading the article! The latte was pretty good, but not spectacular. 🙂 I know – Nutella seems to have a following around the world. Hard to believe with its popularity here that it’s even more of a big deal in Europe! I do and I don’t. I think we definitely need to do our best to choose non-chemical ingredients – and that is a bigger step than most might think! But I think even “healthy” bloggers need to call a spade a spade. Dessert is dessert. A treat is a treat. And in reality, there isn’t yet a definitive answer on which sweetener is best! Some may say agave, but if you have FODMAP issues, you may actually be better off with plain old cane sugar. Neither is nutritive enough to call health food and both will affect your blood sugar. And honestly, we need to stop beating ourselves up. It is all about balance. Just because you had a donut – even if it weren’t Mighty-O, doesn’t mean you aren’t a healthy person. It means you had a treat that day, hopefully enjoyed it, and it’s balanced by the other 80+% of your diet that is full of nutrition! Hi Alisa. What a lovely, thoughtful comment. I totally agree on all fronts. Thanks for taking the time to read the post and share your perspective.